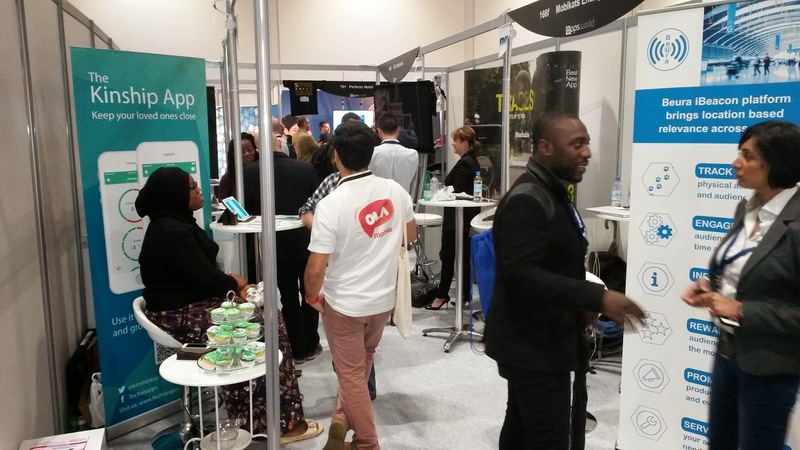 Firstly, a massive thanks to Apps World 2014 who gave us twenty-four stands to offer out to startups from the community over the two day conference - 12th and 13th November at ExCeL London. Around half of these were in the current intake or alumni of The Mobile Academy (the course we host with UCL). Armed with my dictaphone, I interviewed our startups and they all talked about the diverse range of people that they met over the two days including web developers, investors, universities, corporates, press and bloggers. There was also mention of lots of different sectors; such as music and fashion. Douglas Robb of Scramboo, talked about two of his favourite conversations: "I met a major English football club that are very interested in the product and someone yesterday refused to tell me their identity but this morning I received a LinkedIn invite from them - turns out they were very senior in a large corporate...it was very worthwhile"
Of course, it was also a great opportunity for some of the startups to engage with end customers too: 5 Tiles (Jose and Michal pictured here), were testing out the usability of their new keyboard for small devices on a Samsung smartwatch. They were delighted how quickly people were able to grasp their new interface. They also found a whole new target group where their product was providing a great solution for those with reduced dexterity. Frederick of Adsy (love their branding!) also said that he had met quite a few of their 23,000 users and it was great to get feedback, confirmation of customer need and find out about ways they were using the product. 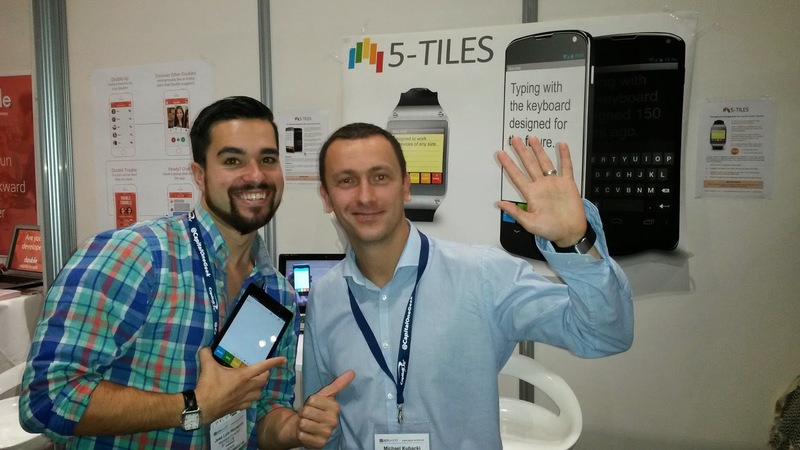 Albert at Quiztix added how useful it was to meet other startups and celebrate how far the word of Apps have come along. His team members enjoyed the opportunity to meet customers face to face. 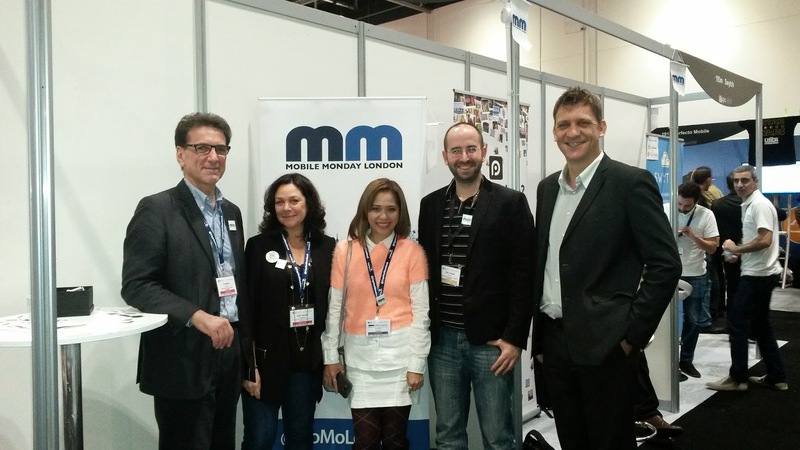 From our side, we had many of our friends from international Mobile Monday chapters pop along to see us - here we have (left to right) London, London, Singapore, Tel Aviv and Singapore! 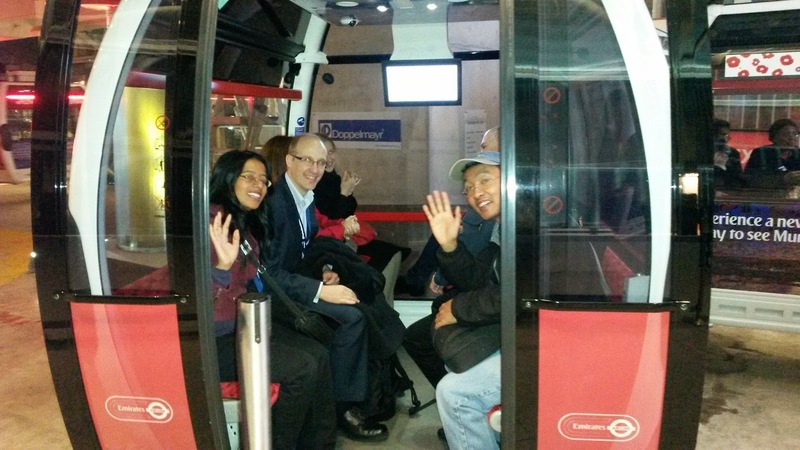 We also had a great opportunity to take a ride on the new cable car over from ExCeL to the after party at the 02. For me, the whole experience reinforced how lucky we are to live in such a diverse and vibrant city - a hot bed of innovation that pulls people from all over the world. Well done to the startups and thanks to those of you that came down over the two days to support them.